About five years ago, I bought two ginormous Henri Matisse prints for $10 each from Art.com, then had them framed by Framebridge for about $120 each. It was a huge splurge at the time, but even now, I’m positive it was one of the best investments I’ve ever made. Because at the end of the day, $240 is honestly a steal for such impactful pieces. I feel happy when I come home at the end of the day and see those big, graphic prints on my wall. They make my tiny New York apartment feel homier and more purposeful; more like me. Bottom line? Coming home to beautiful art improves my quality of life...and yours (y’know, like plants!). You’re probably not trying to spend crazy dollars on art for your home—who is? Maybe you just graduated and know you need to upgrade from that poster of Einstein with his tongue out taped to your dorm wall that was supposed to make you look “smart yet playful.” Or perhaps you just got your first place without a roommate, and they were the ones with the collection, not you. Perhaps you just bought a home! That’s expensive! Being on any kind of a budget, however, does not exclude you from surrounding yourself with great art. Pieces that capture your personality, express your taste, or just make you laugh aren’t restricted to gallery purchases. With the right frame, even a poster of your favorite movie can look sophisticated. Generally speaking, choosing pieces that have some colors in common, or that look nice together (yes, it can really be that simple) is a great place to start. Even if you’re not sure yet what your “taste” is, just picking art that’s the right size for your space will make all the difference. Don’t panic if you don’t know where to start. I’ve gathered nine of my favorite SG-approved sources for prints, original works, framing, and even some vintage-hunting. Listen, I’m not here to tell you that everything you can buy from this website is a slam dunk. (We’re all excited for the final season of Game of Thrones, but you don’t need a poster of John Snow in your living room, you feel me?) However, if you comb through the vintage-inspired music and movie posters, you can find fun pieces that telegraph your taste without looking like the remnants of a college dorm. For example, this $5 The X-Files poster could work in the right context...i.e. surrounded by pieces other than additional X-Files posters. Similar to AllPosters, Art.com is a really (like insanely) affordable source for prints. Hop over to their website and you’ll be greeted with a window offering 50% off your first order if you fork over your email address. Do it. You could create an entire gallery wall of Chagall, Monet, Adams and Kahlo for under $30. When you want art from fresh talent…. This is a site for getting joyfully lost. 20x200 collaborates with contemporary artists (a.k.a. living people making cool art right now) to release limited-edition prints and original works throughout the year. Prices range from $24 to $10,000, so you can really put your own spin on what “affordable” means. 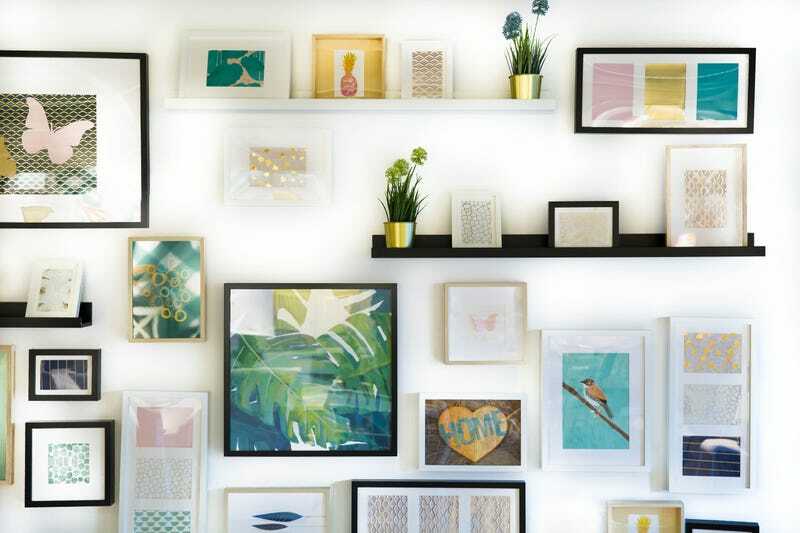 Another site that can be slightly overwhelming if you’re unsure what you’re looking for, Society6 features art that touches all genres, and sells prints in a variety of sizes so you can customize a whole gallery wall with picks from their artists. Currently, I’m obsessed with Beth Hoeckel’s collage art and the vintage-looking prints from aapshop. A can’t-miss home decor tip is to put “cheap” art in a nice frame. So once you’ve found your gigantic $10 Matisse print or your colorful $6 Beatles poster, send it off for a custom frame from Framebridge that will look amazing without forcing you into a Top Ramen diet as a grown adult. An acronym for “everything but the house,” EBTH is a dream for anyone who loved combing through their grandparents’ garage, looking for treasure. You can bid on stuff from estate sales around the country, which includes anything from framed art to tabletop glass art and furniture. Oh what, sorry—did you think SG was too good for the OG peer-to-peer marketplace? Please. I’ve recently procured a few true gem finds from all over my fair city, including an ocean-view landscape from an interior designer who’d used it to stage an apartment. I scooped it up for a song, and now it’s on the wall of my bathroom above the towel rack where it fits surprisingly perfectly. Take a peek (and be patient)—you never know! Nothing irks me more than stalking a piece from one of my favorite shops, only to have it sell out before I can get my paws on it. eBay is my go-to next step; I’ve procured quite a few pieces that originally got away! Oh, and don’t sleep on the vintage! From taxidermy to wall hangings, tabletop sculptures and other ephemera—eBay is a treasure trove of weird art finds. Does Recess CBD Seltzer Live Up to the Hype?